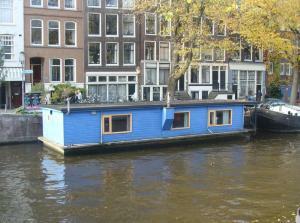 The Blue Houseboat lies in Amsterdam’s famous Prinsengracht canal, 300 meters from the Anne Frank House. Features include fully equipped, modern kitchen and a small terrace with canal views. The living room is furnished with a seating area around the flat-screen TV with cable channels and a DVD player. Blue Houseboat has one bedroom with a king-size bed and a bathroom with shower. Guests can make use of the kitchen equipped with stove, microwave and refrigerator. There is a dining table as well, all the necessary crockery and cutlery are provided. From the Blue Houseboat, it’s 1 km to the Leidse Square entertainment area. Dam Square is 650 metres away. The Westermarkt tram stop, offers an easy connection to Central Station.